"Do you speak Irish?" Rory Gallagher asks Hérve Picart. Somewhere in Europe. A modernist hotel smells of credit cards and air conditioning. Behind its thick windows, sheltered from the world, is a neighborhood like any other, with the inevitable periphery of streets –concrete constrictors around the fog imbued city. From the spacious hotel's aquarium lobby, we can only perceive a muted buzzing: urban spasms mustn't stir the negotiating financiers’ gin fizzes. In this sterile ambiance of off-gray and traditional fauna, we can spot those that are there on business. This reminds of me of the cruel tale in which Villiers de l’Isle d’Adam uses the exact same words to first describe the Paris morgue, then to describe a famous financier's café located on the grand boulevards. Seeing these spick-and-span zombies living under the perpetual anesthesia of convenience and convention certainly displays a morbid, macabre aura; especially when we imagine the purely cannibalistic impulses located within their cerebellums. And then there are the women: those powdered pheasants, wearing their proliferate furs, with their permanently clotted smiles from their most recent facelifts, leaving their thick trail of Chanel; or worse yet, those enamel-painted tarts acting the part of the bloodsucker on the arms of their dashing protectors with their pomaded alopecic dos and their noble bellies. Brrr. A sinister carrousel. But suddenly, something perturbs this lugubrious ballet. No one knows what new incongruity spices up this tableau. Though, it's as if the air has suddenly warmed itself up, abruptly. Without a doubt, a flaw in the sterilization system: a breath of life has crossed the aseptic air. In fact, it's simply, only a long-hair walking into the hotel, strutting like a sailor. For the record: ever since I've been observing the comings and goings of the people from inside this “Bromotel” lobby, he was the first of them that I saw walking in from the outside with a glass of whisky in hand! It didn't take me much more to identify Rory Gallagher. What's rather staggering about this devilish Irishman is that, whether he's climbing on stage or fumbling into the room you're in, the result is the same: a deliriously brisk current of warm air on two legs greets you. Here (in the hotel lobby), his whisky glass carries the same weight as his beat-up Strat does on stage. What an entrance. Rory belongs to that group of people whose human radiance is enough to put you under his spell even before he utters a word. In that sense, he's from the same race as that adorable (Peter) Gabriel. And then, with a few fluid words and salutary greetings, a deep and velvet-smooth look, a friendly tap: he envelops you and draws you in. You exude towards him, the same irresistible sympathy and affection you'd show a friend of twenty years. Since the beginning of his career, throughout the years of performing his standards, he's hardly changed. That's a bit why I didn't situate this particular encounter within a specific time frame. It could have taken place anywhere in the world, at any time. From the beginning of the 70s, Rory has always been there, unchanged: the adulated performer mocking the “style-de-jour” and dragging each generation of kids to his shows; creating around him and his festive music an impossibly sacred union, consisting of and encompassing all members of each sect of the rock world. In many ways, Gallagher's rock is always en vogue. Despite the fact that his face is somewhat fleshier and his silhouette, somewhat portlier, he still has that engaging little face that carries itself so well with his music. He still wears his rustic plaid shirts and his reefer jacket, giving him the allure of rock music's own Cap Horner. This puncture-proof son of Eire appears to be timeless and just as unbreakable as his vivacious rock, which refuses to crumble through the various trends and continues to unanimously warm up the hearts of those who crave its loud vibrations. In the elevator, which will take us far away from the hotel muzak that sticks to the skin like tropical heat, and lead us to a calmer surrounding, he continues to sip his whisky, as his hands fascinate me: they're fine, strong, well-manicured, young man's hands. I'm only worried by the tremors that agitate his hands – but Rory is on tour, nervous and edgy, and so I prefer attributing the cause of the trembling in his hands to that context rather than read it as a result of the amber and fruity liquid that the Irishman is ingesting with the confident serenity of a baby nursing at feeding time. Hervé Picart: How do you feel in regards to your present status in the rock world? Periodically, it is said that you are passé or forgotten, but more fans still attend your show and fill up the halls when you’re in town than all of these other chart-topping trendy bands that command a higher asking price to their shows? 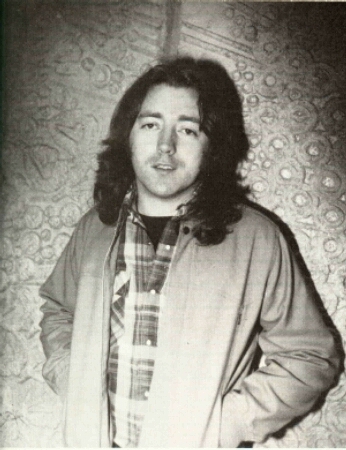 Rory Gallagher: It’s not easy to say. Ultimately, I’ve always cared to play my music like I heard it, without preoccupying myself with what was going on around me. There will always be trendsetters and followers, and it is towards those people that the press and the media gear their attention. What the press has done for New Wave is enormous. There are some that say that the movement was a press phenomenon above and beyond anything else. Well, as far as I’m concerned, I don’t benefit from such publicity. They rarely speak of me. I don’t think that I’m a “good” subject. Besides, since I’m always on the road around the world –sometimes in the States, sometimes in Australia– people in England often, sincerely think that I’ve disappeared from circulation, that I don’t tour anymore, that I don’t play rock anymore. It’s my fault after all: I’ve never said that I’d set or follow any fads. I’ve always played my music like I felt it –a bit of rock, a bit of blues, a bit of Rhythm ’n’ Blues, and I’m happy. And from the moment that I’m under the impression that I’m giving people a sense of feeling, of energy and pleasure, I don’t have any reason to look any further. Besides, these fads are so temporary, so fleeting, that you can’t let yourself be frustrated by them. Sure, I’m old school, but I’m happy like that and it doesn’t seem to displease others, or at least from what I can see at my concerts. Having said that, I’ve got nothing to say for or against these trends, this or that fad or fashion –I feel like I’m completely out of this system, not concerned with it at all. H.P. : If we look at what the Rolling Stones –who’ve also lasted a long time– and what they’ve done, they always got hooked up with each passing fad. No doubt they’re attracted towards the desire of adding these new rhythms and colors to their sound. Have you never felt this temptation of appropriating yourself with a new sound that could be heard on the radio? R.G. : I think the Rolling Stones are fundamentally a Rhythm ‘n’ Blues band, rock perhaps, it’s their real nature and it’s in this field that they’ve been at their best. But, besides that, they played disco, reggae, but it’s more of an accessory and I don’t believe that it’s essential for them. Well, I like listening to what’s going on too, and I find that a group like The Clash is interesting in the way that they get influenced from all corners, and do a bit of everything: reggae, rock, etc., but I wouldn’t know how to do it. In fact, I like music with thick riffs, like blues, Rhythm ‘n’ Blues or hard rock, because I find that these types of music have –how do I put this– a bottom or roots to them. When I play some of it, I feel like I’m inside something that is compact. But things that are too trendy are all pop to me, and pop music feels too superficial. I definitely don’t like pop songs. To me, it doesn’t have the same direction as the things that I do. But finally, to each his own. You can thrown in any type of fad that’s imaginable and disguise it electronically or with reggae, but I think the essential for a musician is to let himself be guided by his feelings, by what makes him feel good; that’s what I’ve been doing for the last decade. If I were to define my music, I’d say that it was a combination of all musical styles that gives me pleasure to play. H.P. : It would seem that presently in France, the mass public is more attracted towards surefire product, towards seasoned veterans that are guaranteed to give them pleasure –like you. We talk about Gary Numan here (in France) or others like him everywhere else, but it’s towards Gallagher that the masses tend to gravitate. Have you felt that on your behalf? R.G. : Certainly. But you have to remember first and foremost that rock has a more attractive power to it -from a popular standpoint– than electronic music or experimental forms of music. If there are more people at my shows than at Numan’s, to use your example, it says a lot about the nature of music. He has a cold, clinical approach, its only sounds. Rock –like mine– seeks out sweat and energy, so it’s more human, and therefore more accessible to a larger public than electronic music. H.P. : For the last ten years you’ve been playing all over the world and haven’t been unemployed too often. Your world tours become longer and longer each time. There seems to be a marathon-like quality to your life. How do you feel when you start off a tour, like now? R.G. : If, by a marathon you mean an obstacle race, I don’t feel like a marathon runner. It’s true that we really work a lot everywhere: the U.S., Europe, Australia, Japan, but by doing so, I’m not really giving myself much of a challenge. I’ve got nothing to prove to myself or to others. I really enjoy touring. I adore that lifestyle. I don’t see why it’s such a big deal that I go out and tour this much to please myself. It’s true that a lot of artists tour because they have to tour. Some hate it, others are bored by it, and others are simply stage fright. For me, there’s no particular benefit to touring, I just like doing it. It’s really a pleasure to tour and I find myself very fortunate to be able to do so. H.P. : But, over the last ten years, don’t you feel that you’ve changed, evolved, on a human level or on a musical level? Even though your life is still the same, you’re not the same Rory Gallagher. R.G. : Of course I’ve evolved, as much on the personal level as on a musical level, but not in an obvious fashion, I think. In my music, the evolution has always been slow, and always within the structure of the things that I like to begin with. I still have the same approach towards music that I’ve always had. I’m not one of those (people) that can voluntarily cut away from my roots, from my predecessors. I want to progress, but always in a way that is attached to the blues, to Rhythm ‘n’ Blues. In fact, I like all sorts of music: I’m also into hard rock, rockabilly, Cajun –any music that has a beat to it. My goal, my desire for progression isn’t to have a superficial rapport or a formal rapport with these types of music, but to get inside them –always further– and to interiorize them, not just to the point where I can play them, but to the point that I can also write them and be able to create them. But there is other music –like electronic music– that I like simply as a listener; ambient music, like Tangerine Dream, or Eno, but I don’t feel the desire to play it, because that music isn’t in my nature as a musician. H.P. : You’ve finally come unto your own in this well-traveled type of music. You don’t seem to come from that breed of musicians that can only achieve personal accomplishment once you’ve created something unique unto you. Gabriel plays Gabriel, and Gallagher plays the blues. R.G. : That’s not quite true. Before I die, I want to leave a Gallagher sound, a Gallagher style. But I don’t think that creating necessarily means experimenting from scratch. I think that one of the most beautiful musical legacies is that of Ornette Coleman’s, the jazz saxophonist that was able to create a totally individual form of art, from an existing form of music: jazz. To be yourself doesn’t necessarily mean being different from others. In fact, there are some people like Peter Gabriel that do have that approach, but Gabriel makes progressive pop that he extrapolates from the pop world, much like I do from rhythm and blues. Both of us transform our roots into more individualized terms. People like Stockhausen or Pharoah Sanders in jazz, or Archie Shepp –those are true experimentalists. But I think that you can still leave a mark, your personalized stamp on non-experimental things, and I think that I succeed in doing that. Blues and rock are a starting point for me to find myself. I build myself up through my roots –I‘m not enough of a visionary to project everything in one piece. Besides, I think that the greatest experimentalists work from their roots too. A writer, just as “new” as Joyce, was also influenced by everything that preceded him. H.P. : You speak of rhythm and blues as part of your roots, and that form of music, is, curiously, a basic ingredient in most Irish groups, whether it be Thin Lizzy or the Boomtown Rats. How do you explain that? R.G. : In fact, it’s difficult to explain. It’s true that most Irish groups have something or other to do with rhythm and blues. I think it’s due to the significant influence that groups like the Stones, or the Animals have had on us, (groups) who were also impregnated with rhythm and blues. Van Morrison was the first to follow suit, and since then, Irish rock has always been colored by that musical style. Even though I still think that Irish rock is different from English rock. It goes through London, it goes in the same direction –but in its own way. And I think that people like me with the blues; Lizzy with hard-rock; the Rats, the Undertones or Stiff Little Fingers with New Wave; we all have an Irish approach to our rock, a truly different feel for it. I think it’s in part due to a special style of songwriting. H.P. : In your musical journey you followed a path similar to Johnny Winter’s. You started off with hard rock –breaking away from your roots– then you returned to musical forms that were purely Gaelic or bluesy, and made a return to acoustic music; and now, you seem to be redirecting yourself towards electric rock again, just like Johnny Winter has done. R.G. : I’ve been called an “Irish Winter”, but that’s merely a coincidence. There is a great difference between the two of us: I write my own songs, he composes very little. Besides, he’s more traditional than I am. But we also have many similarities: acoustic blues, slide, similar musical tastes. Although I find that I’m more progressive than he is, in the measure that I believe that I evolve from a personal viewpoint within each musical style. H.G. : On stage, you’ve gone back to a trio, giving up the keyboards. Is that your personal preference by far? R.G. : Absolutely. A trio is the best form to showcase each musician’s abilities in a rock band and bring them musical freedom. And, it forces each musician to double up on their sound, to be constantly rhythmic and melodic at the same time. It gives a better musical balance and forces the musicians to not wander too far off from the arrangement. And, the less people we are (on stage), the easier it is to improvise and change the arrangements. We can hear ourselves better. Improvising is a lot easier, so it’s more agreeable, because the more the music changes, the less repetitive and the less uniform it gets, because if there are more musicians on stage, they can only play according to what’s already been performed (by the other musicians on stage). H.P. : But doesn’t this formula better flatter the lead guitarist’s ego? You’ve rarely played with other guitarists within your band: do you refuse to share the duties? R.G. : I don’t know if I’m egocentric. I like the twin lead guitars in Thin Lizzy and other bands, but I don’t feel the need or the desire to do it. Yeah, maybe the trio formula does cater to the lead guitarist’s ego. If that’s the case, then I’d like people to say that I’m as egocentric as Jimi Hendrix –I would be very, very flattered. But honestly, since I’m constantly mixing rhythm guitar with lead guitar, I don’t need another guitarist in the band, which is probably the reason that I’ve always been alone on guitar. H.P. : With Taste, you started off with playing hard rock, but you quickly refused to continue playing the role of the metal guitar god. Why? R.G. : I think it’s because I never had the courage to play the game. It isn’t only a question of the soloing, there are the movements, the rituals and the mountain of Marshall amps, and I got bored with that very quickly. I like the force, the energy that comes from hard rock, and that’s why I play hard rock, but I wouldn’t be able to only do that. I’m someone that is musically curious, somebody that doesn’t like to get pigeonholed, and I don’t feel any disposition towards assuming the rituals, the smoke and mirrors that hard rock requires. I like that music, but not the exterior posturing. I find it to be fairly limiting, frustrating. Bands like Motörhead, Iron Maiden or Saxon do their heavy metal very well, but I’d like to see more variety, more musical fantasy in what it is that they do. That’s why I prefer more flexible bands, like UFO. H.G. : For the young kids that are only discovering Gallagher at the same time as Iron Maiden and that don’t know which album of yours to choose from your back catalogue, which of your albums do you feel would be the best introduction to your work? R.G. : From a production standpoint, I think the most recent studio album is the most convincing one – I’m talking about Top Priority. The best introduction is still my last live album, I think. But from a personal viewpoint, I have a very big soft spot for Tattoo –from all of my old albums, it’s the one that I prefer. H.P. : It seems odd to we the French who discuss politics everywhere, that, with all of the problems in Northern Ireland, the most famous groups from Eire –like Lizzy, the Boomtown Rats or you– never discuss politics. R.G. : It goes without saying that I have my own opinion on what’s going on in Ireland, but it’s something that is too complex, too grave to be expedited in the few words of a song. My opinion is that Ireland must become a united country once again, that Ulster is a country that is kept alive artificially, and that only the reunification of Ireland makes sense. Well, that’s my opinion, only my opinion. The political song exists in Ireland and is very alive. It reflects all opinions. Me, I grew up with political verses. There are good political singers, but in the long run, I find it useless, inappropriate even, sometimes. Certain Irish groups like Stiff Little Fingers wrote strong material on the subject. But in that group’s case, it’s more social than truly political: these are emotional reactions from people that say what it’s like to live in the streets of Belfast. Politically speaking, it doesn’t really have a reach to it, and I think that political involvement must be followed up. Only looking to unblock things, through songs, will never be enough. Me, I would feel very useless if I were to claim my humble opinion in my songs. I know that this point of view must surprise the French, what with the strong tradition that your people have in this domain. But, what I don’t like very much is that the political song is quickly becoming a fad, an exercise in style in which the content is disappearing, little by little. And I’m not looking at making rock music more serious than it already is. We can’t amuse people with nightmares. Now I’m not saying that we have to load up the genre with ineptitudes like “Rock! Rock! Rock! Love! Love! Love! Yeah! Yeah! Yeah!” But depth and philosophy ruin rock. I like effective words that feel right within a riff, and especially words that won’t feel encumbering, five years later, when I’ll want to sing them again. H.P. : For the French, Ireland is Guinness, the Green rugby team and Rory Gallagher. When you’re in Ireland, do you feel a certain national pride that is attached to your name? R.G. : I’d have to say so, yeah. My people are fairly proud to see a fellow Irishman please people around the world with his music. Whereas the English see their bands as products to be consumed, the Irish consider their bands to be emanations from their country and are truly proud of them. But that’s normal, because it’s a small little country. In any case, this little country gave birth to one of the greatest rockers that be, and one of the genre's most charismatic ones. It's never hurt a country when its ambassador is liked for who he (she) is. There'll soon be a little bit of Ireland in (here in) France, thanks to Rory, who's coming back with a new record and a new tour –timorous and friendly, like he always knows how to deliver them. It's odd, but you'll see what I mean if you've never met him before: whether it be after leaving an interview or coming back from a concert, this dear Gallagher will always leave you with the impression that you've made a new friend.